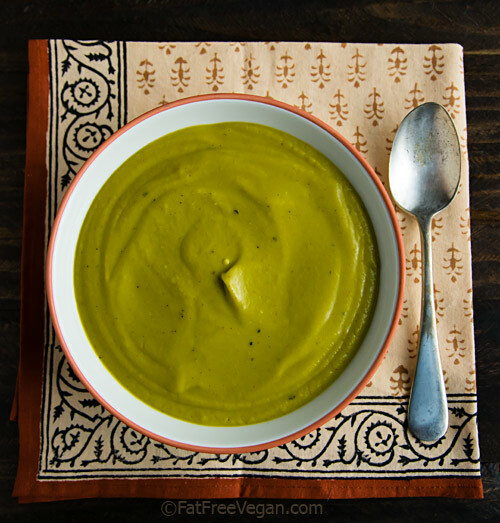 You can make this creamy, ridiculously easy, vegan broccoli soup two ways, curry spiced or savory. For someone who has such definite opinions about all sorts of things–politics, football, sensible shoes–I can be so indecisive in the kitchen that it’s a wonder my family doesn’t starve. I’ll often have an idea for a recipe brewing in my head for days before I actually go and cook it because I can’t quite decide on the seasoning. And sometimes, as with this broccoli soup, I simply don’t decide–I make two batches and my whole family does a taste test and is saved from starvation for a few days. Well, I didn’t exactly make two batches but rather one batch that I divided in half before adding the seasonings. I really wanted a straightforward broccoli soup, a soup that tasted like the vegetable itself, not a lot of seasonings, but I was afraid that might be boring. So I divided the ingredients exactly in half (a kitchen scale makes this doable with ingredients like broccoli) and made one half “plain” and the other half curried. I was very happy with the plain version, but just to make see if an addition of herbs or lemon juice might make it better, I further experimented with individual bowls of the plain soup. Still, I liked the plain soup the best, a big surprise for someone who sprinkles habanero seasoning on almost everything. 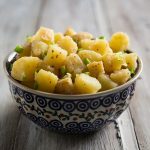 My husband, on the other hand, went crazy for the curried version, a simple variation that I made by replacing the gold potato with sweet potato, adding my favorite Maharajah curry powder, and increasing the red pepper. 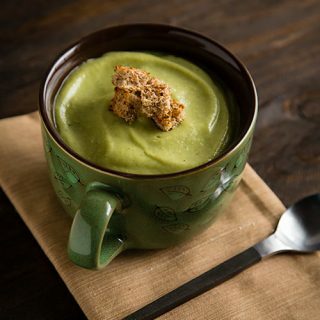 I liked it too, but sometimes I just want a broccoli soup to taste like broccoli, and I found the plain version to be creamy and full of natural flavor. So give both versions a try to see which you like best. Or, better yet, do your own experimentation and let me know in the comments what additions you like. Before I get to the recipe, let me tell you where you can find the recipe for the Fat-Free Ezekiel Bread Croutons that you see in the photos: my new newsletter, of course! The first issue went out this past Sunday, and if you weren’t subscribed, you missed it. Just kidding! You can subscribe today and still get that first issue with the crouton recipe here. You can vary the flavor of this basic soup by adding a teaspoon of thyme, basil, or any herb during the first step. For a delicious change of pace, try the curried variation at the end of the recipe. Place the broccoli, onion, garlic, and vegetable broth in a saucepan. Bring the broth to a boil, cover, and reduce heat. Simmer until broccoli is tender, about 8 minutes. 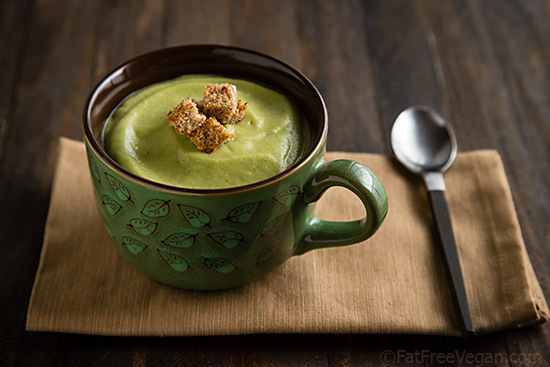 Put half of the broccoli and broth into a blender with half of the potato and cashews. Blend at high powder until smooth. Pour into another saucepan, and repeat with the rest of the broccoli, potato, and cashews. Heat the soup, covered, on low for 10 minutes or so. Check seasonings and add salt, freshly ground black pepper, and a pinch of red pepper to taste. Add 1 teaspoon of good, mild curry powder to the broth in the first step. Substitute a cooked, peeled medium sweet potato for the Yukon gold potato, and add a larger pinch of cayenne pepper to finish. Well, maybe this broccoli soup isn’t exactly the Christmas treat you’re looking for, but I’ve got you covered. I’ve been pinning Christmas Recipes on Pinterest and tagging Holiday recipes here on my blog. And, if you’re still looking for a gift for an avid cook, check out my Kitchen Gift Guide or my Amazon store. Previous Post: « Introducing NewsBites! Simple bliss in a bowl. Amazing that something so quick, easy, and nutritious can be beyond satisfying (made the plain version). Thank you! Wow! I just started a whole foods diet- weight loss is a main concern as of right now- but once I reach my target weight of 189 (I’m 205 now at 6′ 1″) I want to just eat healthy and not worry about reading calories… I’m so glad to have stumbled onto your site (thanks Google)! 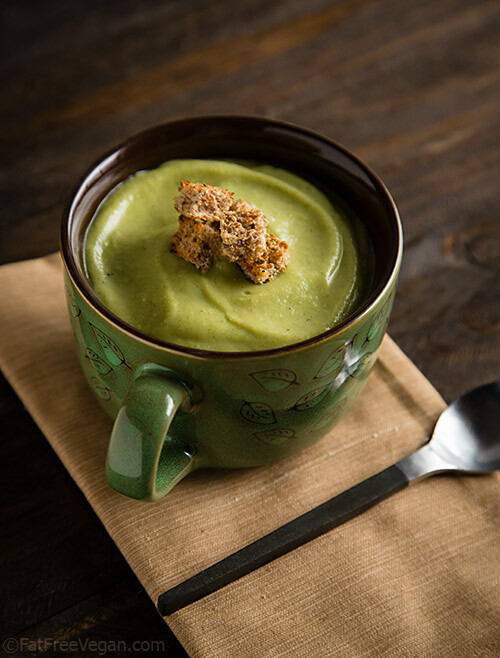 I can’t wait to try this broccoli soup- thanks Susan for sharing your food ideas with us! YEP! LOVE IT! SOME VARIATIONS B/C THAT’S WHAT HAPPENS IN THE KITCHEN… BUT IT WAS FABULOUS AND WILL DO IT AGAIN! NOT AS QUICK AS I THOUGHT B/C I HAD TO WAIT FOR POTATOES TO COOK. YEP IT WAS GREAT!! SIMPLY ENOUGH TO NOT MESS IT UP… I’VE MESSED UP A COUPLE EASY RECIPES LOL!! I LOVE you! You have come to my kitchen rescue so many times. I made this with leftover barely steamed broccoli which I added in towards the end- with the cashews and it was wonderful. Thanks! Next time I also have leftover sweet potato/yams I will cook the curry version. This was fantastic; I make a batch and take it for a week of lunches about once a month. I microwave the potato for 4-5 minutes to speed up preparation. I prefer the original spices and have added cayenne pepper or red pepper flakes to add a little heat. 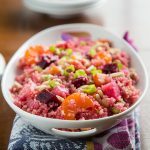 Thank you for such a simple, delicious, healthy recipe! Have you (or any other blog poster) attempted this kind of variation? And the results? To answer my own question, I ended up making, instead of this recipe, a broccoli and corn cheezy chowder, which was a variation of Oh She Glows’ broccoli and cheeze soup (http://ohsheglows.com/2011/12/20/broccoli-cheeze-soup/), but using Susan’s cheeze sauce and no oil, then throwing in some corn kernels at the end. It turned out really, really good and very pleasant indeed. But alas, like its non-vegan counterpart, not a favorite. My boyfriend surprised me with this soup for dinner a few nights ago (he knows I love any recipe from your site! ), only he used cauliflower and a sweet potato (also added curry powder and omitted cashews since I’m on McDougall right now). It was one of the best soups we’ve ever had! We just harvested broccoli from the garden and tonight we’re making the broccoli version. I’m sure it will be just as delicious! I tried this soup, and it was good, especially considering how easy it was. I did try the curry version, but curry powder was too “curry powdery” tasting. So I tried a “chaunk” using some hing, cumin, green chili pepper, turmeric, calendra, and a 1/4 teaspoon of rice oil (I skipped the garlic all together), threw it hot into the basic soup, and it was definitely approaching heavenly. Can this soup be frozen? I’m preparing for post-partum freezer stock up, and I really need some easy stuff that I can freeze in bulk and just warm up. Any ideas for what to type into your search bar to find those types of casseroles/soups/dishes would be great. I love your site so much. haha thank you for being you n_n I’m trying to be more vegan and cook more and being only 15, I’m not allowed to cook certain things at home. But, thanks to you I’m able to experiment and make A-M-A-Z-I-N-G foods. 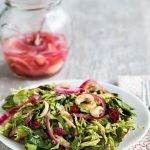 I just wanted to say that through the years of scouring the web for healthy whole-food recipes, and dabbling in and out of diet ‘fads’, your blog has always been a sort of safe haven filled to the brim with simple, delicious and healthy recipes. 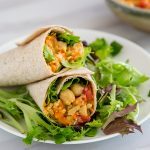 I’ve pointed many friends and co-workers to your site, and no matter what their eating habits are they all find your recipes easy to follow and easy on the tummy. I wasn’t sure where to post this, so I figured I’d post it on the next recipe I plan on cooking up for the week! A sincere thank you for all the work you do from myself and my boyfriend (whom happily devours everything I’ve made from your blog). Thank you so much for letting me know that my recipes are working for you. It’s people like you that keep me cooking and posting! I have been trying to clean up my family’s eating habits and your blog has been a huge help. I made this recipe last evening for what was originally my dinner and my broccoli hating husband ate a bowl and then came back for seconds and thirds!!!! He took it for lunch again today… We LOVED it!!!! Made the curried version last night. It was amazing. I doubled the receipt and used half broccoli and half cauliflower. One of the most delicious meals I have made in a while. I usually only make a dish a few times then move on to new ones, it makes it more interesting for me. This one I will keep and make many times. Your receipts are amazing and I use them often. Best soup I’ve EVER had. Thank you! When I make cauliflower soup, I slice the potatoes (with skins on) VERY thinly and cook them along with the cauliflower…..saves some time and another pan or microdish. Throw everything in the blender (I have a Versa and love it). I think I’ll try that with this. I like one-pot soups. I was so excited to make this that I jumped right in. It wasn’t until I had all the first stuff chopped and simmering away that I realized I used up all my cashews on Thanksgiving. Well, I moved ahead without and it turned out just fine without those. I did add some nutritional yeast to give it a bit of richness. I’m sure it’s better with but in case anyone else is in my shoes, I wanted to encourage them to forge ahead. I look forward to make it correctly another day. 🙂 Thank you for sharing your lovely recipe. Yes, I made the same mistake. Subbed 1/4 cup chickpeas for the cashews, it was still thick and delicious. Have made this before, it’s fabulous! Hope you are well, Susan! Your blog has helped my life a lot!!! Love the photography, that is a beautiful soup cup. Susan, I just made another pot of this. Every time I make it, I say a prayer of thanksgiving for you! You’ve made my “lowfat vegan life” so wonderful. We love this soup and so many other recipes that you’ve created for us. Thank you! I know this is a long time after the recipe was posted, but I just came upon it. Could you tell me what the function of the cashews is? The cashews give it a richer flavor and a smoother texture. Sure, it just won’t be as creamy. I made this and wow! It was tasty, filling and super easy. I didn’t have a yukon gold potato, so I substituted a 15oz can of canellini beans (drained and rinsed). Next time, I’ll have to try the Ezekiel croutons. Hi Susan, I think I’m your greatest fan! I love all your recipes and they’ve helped me to become a full-fledged whole-foods-plant-based cook. I’ve made this soup many times (curry version is our favorite) and it dawned on me that I’ve never included the broccoli stalks, just the tops. Have you ever thrown in the stalks? Thanks for being my biggest fan, jem! 😊 I do actually use the stalks. I just cut off the hardest part at the end and peel it a little if it seems tough. Go ahead and throw them in next time! This soup turned out amazing. I made the straight forward version as I love broccoli and was craving it in soup. This was so flavorful and perfectly seasoned. Best of all it was simple, fast, and did not need a long time simmering to develop flavor. I used my immersion blender to make it even faster and not as much cleanup. I didn’t have cashews, so left those out and it was still delicious. I might try using this with other vegetables such as asparagus, peas, or cauliflower. It was just so delicious and easy. Thank you for the recipe. I love using smoked paprika from Penzeys spices in this soup- delicious! !